We strongly believe that education plays an important role in making people of all ages aware of conservation issues and the importance of the varied landscapes on the Isle of Wight, over 50% of which are designated Areas of Outstanding Natural Beauty. 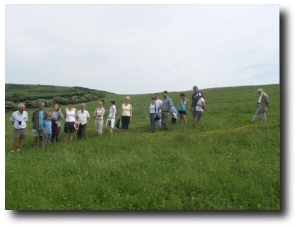 Our guided walks, which are part of the various walking programmes promoted on the Island, aim to inform people about our conservation projects and to stimulate discussion over a wide range of conservation issues. We welcome walkers with specialist knowledge, for we too learn from these occasions. Any organisation that would like a special walk to see Wight Conservation’s work should contact John Paton on 01983 760773. Discover how farming and wildlife conservation go together at Wroxall Manor Farm. Spring Flowers and Highland cattle. Woodland life. The importance of the historic landscape. 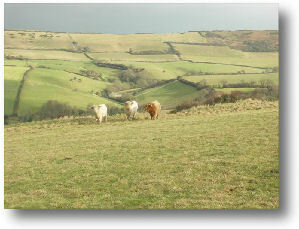 Plenty of photo opportunities of the Wroxall Horseshoe. Meet at Wroxall Cross Farm (GR 557793) for a 10.30 a.m. start. Parking in the farmyard. Nearest Bus top: Wroxall village ¾ mile (approx). Walk will last 2½ to 3 hours. Family friendly. Gentle slopes, but stout footwear advised. No dogs please. This walk is part of the Isle of Wight Walking Festival 2007. Our Bronze Age ancestors roamed these downs which were an important part of their culture. 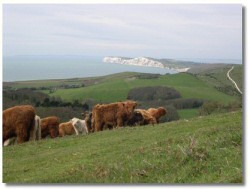 Explore how they may have lived and died and see how Wight Conservation is managing the landscape for wildlife. Meet at the Jubilee car park off Lynch Lane (GR 420846) for a 10.30 a.m. start. 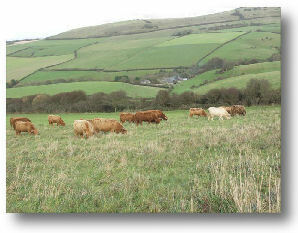 Nearest bus stops are Brighstone 1½ miles (approx), or Calbourne 1½ miles (approx). The end of summer on the farm. Learn more about how a farm can be successfully managed for wildlife and the history of the Wroxall Horseshoe from pre-historic to the 20th Century. Meet at Wroxall Cross Farm (GR 557793) for a 10.30 a.m. start. Parking in the farm yard. Nearest bus stop: Wroxall village ¾ mile (approx). Walk will last 2½ to 3 hours. Family friendly. Gentle slopes but stout footwear advised. No dogs please.. Please ring John Paton on 01983 760773 for further details.